Google has unveiled a range of new products focused on artificial intelligence, which the technology giant hopes will make its services easier to use. At the firm’s annual I/O developer conference, Google’s latest innovations included revamps for its Android operating system, as well as Gmail and virtual helper Google Assistant. 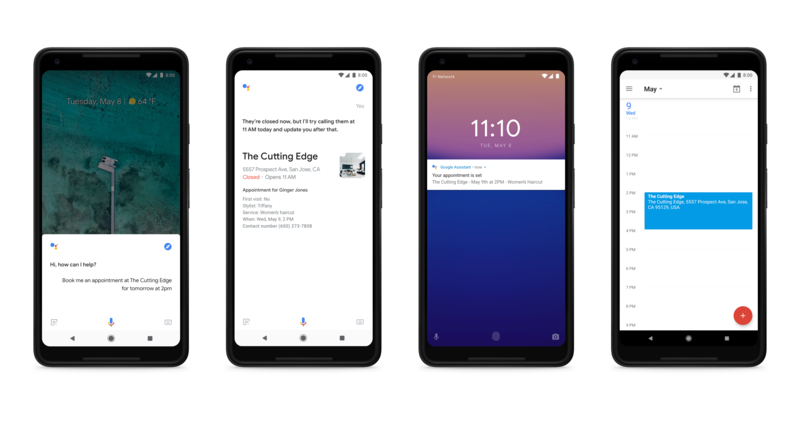 The next version of Google’s annually updated mobile operating system, Android P, is now “smarter” according to the firm, thanks to new machine learning tools at its heart. This artificial intelligence has been applied to several new features, including Adaptive Battery which prioritises power to the apps used most, while Adaptive Brightness automatically tweaks screen brightness. There are also App Actions, which learn user habits and then predict which app a user is likely to turn to next – for example raising a prompt to resume a Spotify playlist when a pair of headphones are plugged in. Android P also includes a range of digital wellbeing tools, including a Dashboard to monitor how a user is spending time on their device and tweak habits as needed, while Do Not Disturb mode silences all calls and notifications – it can even be enabled automatically by turning a phone face down. With artificial intelligence a central theme of Google’s event, its AI-powered virtual helper Google Assistant was a key part of the company’s new feature announcements. Google said it had improved the natural sound of the Assistant’s voice, and will roll out six new voices later this year – including one provided by singer John Legend. The Assistant is now also able to have a back-and-forth conversation without users having to repeat the “Hey, Google” wake phrase before each command, and will also be able to make multiple requests at once for the first time. To encourage children to maintain manners when using Google Assistant, the AI will also now compliment those who say “please” when making a request. A highlight of the keynote came from Google Assistant technology of the future, as Google boss Sundar Pichai demonstrated Duplex – a feature that will book appointments and make reservations on a user’s behalf. Using voice commands, when a user asks for a hair appointment, the software will automatically try and book via a business’ website if it has one, or by phoning the company and doing so through a real-life phone conversation. Google says Duplex is able to understand “complex sentences, fast speech, and long remarks” and so naturally converse and make an appointment, before sending the user a notification to confirm the booking. Having been recently redesigned, Gmail is now adding Smart Compose, which can understand context in emails and offer predictive phrase options to speed up the writing process. Google’s smart camera software is now able to understand words to a greater extent and can copy and paste them from images into the phone as text. It is now also able to identify fashion items via its new style match feature, while the camera can now also be used to help with navigation, with on-screen visuals to guide users and help them find their bearings. The news aggregation app is now predominately powered by AI, with stories pushed to users based on their favoured publications and topics. However, to promote broader viewpoints and publishers, the app will also have a Full Coverage feature which will show how a single story is being reported across multiple sources.